Chevy Suburban 2007 LT K1500. She is silver in color with a Titanium Gray cloth interior. She is a 4x4 with a 5.3 V8 engine, The miles are 129,000. She has a roof rack and a tow package. She runs great and is priced right. She also has 3rd row seating for the family! She is Maryland State Inspected!!! 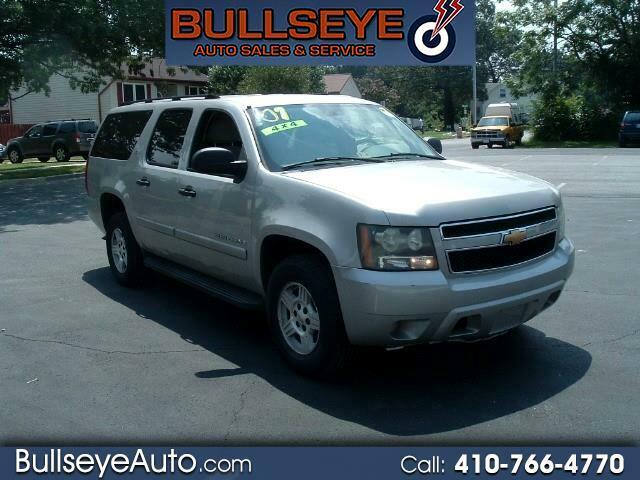 We are BULLSEYE AUTO SALES & SERVICE, located in Glen Burnie, MD. Call Glenn, our phone number is 410-766-4770. See all of our inventory at www.bullseyeauto.com Thanks for viewing. Our hours are M-F 9:30-7 PM, SAT 10-3 PM, other times by appointment.